A man has been found guilty of using an old nuclear bunker as a drugs factory. Jason Whiley, from Brierley Hill, West Midlands, was found guilty of assisting in the production of cannabis at Drakelow Tunnels, near Kidderminster, at Hereford Crown Court. The trial came after police uncovered 885 plants with an estimated street value of £650,000 in November 2013. Wayne Robinson, from Kidderminster, whose brother owns the former nuclear bunker, will face a retrial next year. He denied allowing a premises to be used for producing a class B controlled drug, saying he knew nothing about the plants, and the jury was unable to reach a verdict on his case. 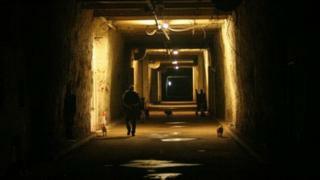 Originally built during as a factory for making aircraft engine parts in World War Two, the Drakelow Tunnels were lined up as a possible base for regional government in the event of a nuclear attack on the UK.